Hoi An Ancient Town which is one of the heritage sites of the World has been becoming an ideal place not only for domestic but also for foreign tourists. Recently, Hoi An has been recognized as one of ten leading tourism cities in Asia, according to Condé Nast Traveler, the world’s premier travel magazine. Therefore, there are a lot of tourists choosing Hoi An for their holiday day by day. Especially, for the new couples, Hoi An are romantic place for their honeymoon which make them unforget. As a local people, I will give you top 7 Hoi An honeymoon hotel. Depend on areas, Hoi An has different hotels. Firts of all, I mention some hotels near the beach area.Victoria Hoi An Beach Resort & Spa is located in quiet place which is very near the beach named Cua Dai. From the room, you can have 2 views that are the beach in the front and the river in the back. It is easy for you to walk around the beach and look sunrise in early morning. In the noon, the couples can lie along a stretch of white sand beach and sunbathe. In the hotel, restaurant overlooking the river are great-night was sparkling with lanterns floating on river. The rooms are decorated beautifully with many colorful flowers. In general, all services are really professional. You are adviced what services you need in your holiday and staffs are very frienly, lovely and warm. These of things I mention above, this hotel was honour to get award “TripAdvisor Certificate of Excellence 2013” from TripAdvisor- one of the most famous websites about tourism in the world. Another hotel that is near the beach is Sunrise Hoi An Beach Resort. Perfectly located alongside Cua Dai beach – one of the most beautiful beaches of the world with only 10- minutes drive to Hoi An old town, Sunrise Hoi An Beach Resort is an ideal getaway for honeymoon couples. Although this is a new hotel, it attract many tourist because of its beauty. Architecture is a combination between ancient and modern features, which create unique hallmark for the hotel. Coming this hotel, man and nature live in harmony due to wonderful atmosphere here. Soak in the refreshing waters of the pool or relaxing on the little bed under the canopy of a palm leaf color green flowing to admire the coast stretching to infinity, “cuddling” taking natural scenery of Hoi An is also a great choice. Not only that, Sunrise Hoi An is also rich cuisine paradise, where you can enjoy dishes Eurasian diverse marine processing by top chefs experienced. Beautiful ocean than ever when the sun sets, the couples back together hand in hand and enjoy the charm of this place. All these things make Sunrise Hoi An Resort becomes a destination not to be missed by tourists coming to Hoi An. Close to the ancient town of Hoi An, there are so many hotels opened for tourists. Little Hoi An Boutique Hotel & Spa is a good choice for you. Only 0.3 kilometer from the city center, the hotel’s beautiful location to ensure that you can visit the tourist destination quickly and easily. Guests at the hotel can walk around to see the top attractions of Hoi An such as Tan Ki Old House, Phung Hung Old House, Temple Japanese Bridge. ect.. The quality of the hotel is reflected in every room, fan, air conditioning, seating corner, tea / coffee making facilities, air conditioning are devices that you can use . The hotel offers wonderful recreational facilities such as sauna, outdoor pool, jacuzzi, garden, spa to make your trip unforgettable. With an ideal location and facilities to match, Little Boutique Hotel & Spa Hoi An to achieve standards in every aspects. Another hotel is Essence Hoi An Hotel & Spa. It is a beautiful new hotel located just far enough from the centre of Hoi An to allow for some tranquility, but close enough to walk into the Hoai River Quarter for shopping and eating. In this hotel, you can have some free services such as bicycle, breakfast…The menu of restaurant changes daily and flavors of food are suitable for everyone around the world. The rooms are beautiful and clean and have gorgeous views of the pool and rice paddies. Staff are very attentive – could not have been more helpful. They are welcome and ready anytime then you need. It is worth to become a wonderful paradise for your honeymoon. Nestled in the heart of Center City, Hoi An, Hoi An Chic Hotel is ideal for travelers who want to discover Hoi An. Just 2 kilometers from old town-beautiful location, the hotel’s guests can visit tourist sites quickly and easily. Space here becomes ever more amazing because the hotel is surrounded by rice paddy cover the vast. Atmosphere is very peaceful, quiet and interesting. The couple can ride around hotel with green fields and you could see the water buffalo being walked from field to field, and the ducks offered as entertainment. The staff are just great. They are all very young, but seem very experienced in making sure that guests are well looked after. Hoi An Chic Hotel are always ready to welcome tourists and promie that they will bring supprising things to tourists. Far away from Hoi An Old Town, just a little bit. The Nam Hai, Hoi An is voted the best hoi an honeymoon hotel. The Nam Hai resort is cleverly designed with style between modern oriental, which brings tourists an interest. The Nam Hai Resort – Hoi An resort is a 5 star standard in Vietnam, located in Ha My Beach- a beautiful beach in the world overlooking the South Sea, white sand. This hotel há ideal location. It distances 30 km from Da Nang and 11km from Hoi An. Therefore, you can visit not only some tourist attraction in Hoi An old town, but also many nice places in Da Nang city. The property and service are fantastic. Great, big pool and good gym. The staffs are great and enthusiatic..You will have lovely time when you choose this hotel. 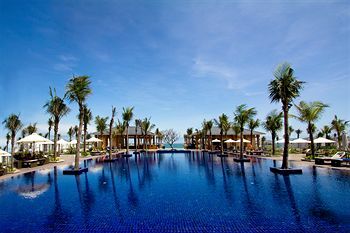 And the last place is Le Belhamy Hoi An Resort and Spa. It is located right in the shore of beatiful beach. The resort spreads with an individual design that have combination between Chinese, French, VietNamese, Japanese culture and architectures. This hotel are equipped many modern devices and decorated carefully from the smallest details.You can ask any services you want and the hotel will strive to supply quickly. Many tourist said that it is a romantic destination for the couples. The staffs are really friendly, greeting and lovely. Coming Hoi An, I am sure that you will have wonderful trip. With the couples, Hoi An make your honeymoon become greatly. Those hotels may be ideal choice for you. Hope the couples will have good time when you come Hoi An.